Why a Gun Safe Dehumidifier? 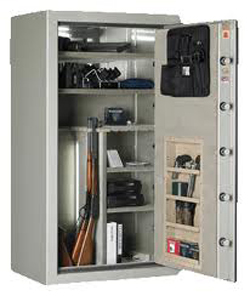 What is a gun safe dehumidifier? Dehumidifiers reduce relative humidity and can maintain it at a level low enough to prevent rust and other damage to the steel and wooden parts of a gun, but portable home dehumidifiers are too big to use in a gun safe. Dehumidifiers for gun safes are small and there are two types, the mini dehumidifier and the heated rod dehumidifier. Here I shall look at both types and describe them briefly. For our detailed dehumidifier reviews of a particular brand just click on the link and you will be taken to the review page. Why would I want a gun safe dehumidifier? When you buy a gun you spend a serious amount of money. A popular handgun, such as the Glock 17, will cost at least $500 and many other makes and models are priced higher. Mass produced shotguns, like the Remington 870 Wingmaster, will cost around $700 to $900, depending on the model, the autoloading 1100 will be more. Of course, you could go for a hand crafted, bespoke scatter gun to scare the crows, and pay up to $50,000, but not all of us are rich. Because $500 or more is serious money for most of us we want to take care of our investment. What's more, if you own one gun the chances are you own more than one. There are about 9 guns in the USA for every 10 people, but they're not evenly distributed. Around 190 million are owned by 35% of America's 100 million households. That's about five guns in each gun-owning home. Now we're talking at least $2500, and possibly closer to $10,000, invested in your guns, but it doesn't end there. Ammunition doesn't come cheap. Novice shooters, especially those whose weapon is for self defence only, need professional training, which usually has a price. Clubs and ranges make charges and many hunting locations will levy fees, not to mention travel costs and accommodation. When you have finished shooting your gun needs cleaning, with materials you have paid for, and then you put the gun away. In some places a secure location for gun storage is required by law. Even where it's not, responsible people want their weapons stored securely, for their own safety as well as that of others. This is why gun safes are as important as strengthened doors, alarms, sensors and other systems of surveillance for security in our homes. Gun safes too cost money, hundreds, even thousands of dollars. Having made this huge investment we want to protect it. A gun safe protects its contents from most thieves but what is happening to our expensive guns while they're in the safe? Everything made with steel, including guns, will be damaged by moisture. The moisture that concerns us here is the amount of water vapor in the air, the relative humidity. Relative humidity is expressed as a percentage. Warm air "holds" more water than cooler air and the percentage is the amount of water held by the air relative to what it could hold, at its current temperature. It follows then that relative humidity rises as the air cools, even if the absolute amount of water remains the same. The higher the relative humidity the more likely it is that some of the water vapor will condense onto solid objects, including our guns. It is this condensation that does the damage. The first step is to measure the relative humidity. For this we use a hygrometer. If the reading is below 65% we don't need to worry too much, although there are some simple precautions we can take. First, it is a good idea to apply a corrosion inhibitor such as Eezox or BoeShield T-9. Second, store your guns in gun socks, but be sure they're the type treated with silicone to prevent rust. These also protect guns against dings and scratches. This may be enough but, if you live in one of the more humid regions, or if your gun safe is located in the basement, garage or another place cooler than your living areas, you may need a gun safe dehumidifier. The problem of high local humidity needs no explanation. But why is keeping your gun safe in a cool place a reason to worry? Remember, relative humidity rises as temperature falls. 65% in your living room could become 80% in your basement. There are two ways to reduce the risk. You can use something to reduce the water content of the air, or you can raise the temperature of the air. Both methods reduce relative humidity. Removing water from the air can be done using one of two processes. First, by using water absorbing "silica gel" crystals, second by condensing the water vapor on to a cold surface using a small dehumidifier employing the "Peltier Process", known as a Thermo-Electric Dehumidifier. Silica gel crystals can be purchased loose or in bags. Loose crystals can simply be placed in a small tub and left in the safe or one or more bags placed at several locations within the safe. Some gun owners find this is an adequate gun safe dehumidifier. The gel is re-usable and when saturated can be dried by heating in a kitchen oven. This can be a rather messy solution as a volume of liquid water will accumulate and the tubs, in particular, are prone to mold growth when wet. The crystals in this unit are colorless and odorless and completely non-toxic. As the crystals become saturated the indicator window will turn pink. When this happens, after between 30 and 60 days, the unit needs to be regenerated. To do this the unit is plugged in to a standard electrical socket for between 10 and 12 hours and when the indicator window changes color to blue regeneration is complete and the dehumidifer is ready for use. The expected life span of the Remington Mini Dehumidifier is around ten years. This unit retails for around $25. There are alternatives, from Eva-Dry for example, which are similar in appearance, performance and price. With no moving parts there is little to go wrong and consumers report high levels of satisfaction with these devices. The principal advantage of these so-called "rechargeable" dehumidifiers is that they do not need a power cable to be fed into the safe. You can read our Eva Dry Dehumidifier Reviews by clicking on the link. We are happy to recommend any rechargeable mini dehumidifier as a gun safe dehumidifier as there is little to choose between the various brands on the market. This type of dehumidifier is not widely used in gun safes and is not a type we recommend as a gun safe dehumidifier but if you would like further details please visit our Sunpentown SD350 mini dehumidifier review page. Many gun safes come with a pre-drilled hole for passing a power cable inside, to allow a gun safe dehumidifier to be used. If yours has such a hole, or you're prepared to get one drilled, you have another option. This is the heated rod gun safe dehumidifier which works by raising the temperature inside your safe and, therefore, lowering the relative humidity. These are mounted inside, on the base of the safe, on brackets which need to be firmly mounted. The added advantage is that the warm air rises and creates a constant circulation of air through convection. A GoldenRod Gun Safe Dehumidifier is heated to no more than 150 deg F (60 deg C) which is a little too hot to hold but too low to create a fire risk. This is a good solution for gun owners whose safe in is a colder location, basement or garage. Sometimes, to be on the, er, safe side :) many folks supplement the rod with bags of silica gel. The GoldenRod Gun Safe Dehumidifier comes in several sizes, starting at around $30. Other similar products are available from Dampp-Chaser and once again the performances and prices of these products are very similar. We are pleased to recommend any heated rod dehumidifier for use in a gun safe although our view is that the GoldenRod Gun Safe Dehumidifier has a slight edge and would be our preferred choice. Whichever solution is best for you we wish you rust-free guns and happy shooting!